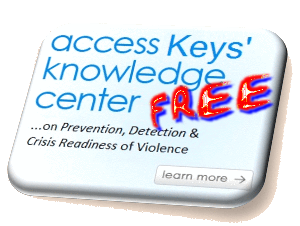 Keys To Safer Schools.com is dedicated to helping parents, schools and other youth oriented organizations to have a safer place to learn, work and play in today’s climate of rising youth violence. Keys to Safer Schools.coman organization based in Cabot, Arkansas, with a global presence through their extensive website, training and network of Associates. The they promote are Prevention, Intervention and Crisis Preparedness. The message in their literature, training and public speaking is aimed at students, parents, teachers, administrators, law enforcement and others involved with young people. The Staff and Associates of Keys To Safer Schools.com offer a depth and breadth of knowledge and experience found no where else on the web. This depth of knowledge is evident in our Executive Director Frank Green a licensed mental health Therapist and a past Assistant Director of the Division of Youth Services (DYS). As the Assistant Director of DYS he was charged with oversight of the State’s Correctional facilities and Serious Offender Camps for juveniles, which held the two Jonesboro Shooters. Mr. Green, a retired military officer, never believed that his demolition training and his training as a Military “Risk Analysis Officer” would be applicable to schools and other youth oriented organization. However, in this day and time it has proven to be extremely helpful.. Another staff member who again reflects Keys’ breadth of knowledge is Mike Nelson, MS, LPC, NCC – Director, Program Development & Instruction. He too is a licensed mental health Therapist. Mr. Nelson has worked with Serious Offender Juveniles. He developed and ran programs in state Mental Health Center. These programs provided a broad range of services from electronic monitoring of Juveniles to Teen Courts to Truancy programs to groups of suspended/expelled students for violent/weapons violations to educational groups and more. Through these leaders and many friends and Associates of Keys, we have grown into a national and even international resource for schools, school resource officers, juvenile justice, youth organizations and parents who have been searching for help in the growing crisis of violence. Keys has provided resources to most states in the US and even to places like Sweden, England, Japan, Germany, Australia, and more. Development of a copyrighted Assessment Tool for the Early Warning Signs to determine when a student needs help. Certification training for numerous schools in the use of the Assessment Tool and Development of a school model for implementing an assessment program. Training schools, School Resource Officers, Juvenile Courts, probation officers, youth organizations, parents and others in Huan Ju: The Art of Blending, an Anger Management and De-escalation seminar. Development and Presentation of a Behavior Modification training program for school counselors and parents. Development and Delivery of behavior-based training on a long term basis to one of the largest school districts in the state. Evaluation of a Juvenile Court system. Evaluation of an Emergency Shelter for children. Evaluation of Federally funded grant programs. Observation and Evaluation of a large scale crisis drill involving multiple agencies in one of the largest school districts in the state. Presentations to professional organizations and associations. Supplying violence prevention resources across the United States and internationally. Coordinated and Facilitated community crisis workshops. Developed and Published Crisis Plans for very small to very large school districts. Grant writing resulting the award of millions of dollars. In school Assessment of students and classrooms. The primary goal and focus of Keys to Safer Schools.com is to provide those who work with young people the tools and resources to produce an environment free of fear. If your organization is in need of services that are not listed, contact us before you search elsewhere. If we are unable to meet your needs, we can probably direct you to a resource that can.